"Humanae Vitae is not an infallible doctrine. In 1963, Pope John XXIII created the Papal Commission on Birth Control to study questions on population and family planning. The Commission included ranking prelates and theologians. Humanae Vitae is not an infallible doctrine. In 1963, Pope John XXIII created the Papal Commission on Birth Control to study questions on population and family planning. The Commission included ranking prelates and theologians. However, it was the minority report that Pope Paul VI eventually supported and which became the basis of Humanae Vitae. THIS "CATHOLIC" TEACHES US TO BE DISSENTERS! I received several emails from TPC readers and even from some SSPX faithful about the coming Rosary Crusade against the RH Bill. Okay, before some of our friends at MST throw a nutty, I am not an SSPX faithful but I sure RESPECT what they are doing AGAINST the RH Bill as compared to those who claim to be Catholic but are wolves in sheeps clothing! So, I have these YouTube videos available about the Crusade. Is there something wrong with joining with the SSPX in praying for the death of the RH Bill? I sutmbled upon this interesting survey and contributed my opinion. I am an active Catholic. Active in Catholic social action as a 4th degree Knight of Columbus. I am an active Catholic, that is why I love the Traditional Latin Mass. I just go there to worship. No hand shaking, no cheesy stuff. I do not attend the Traditional Latin Mass to OBSERVE. I go to Mass to pray. Because the Mass is Calvary once again, and I am there beside Mary and John at the foot of the cross. Because for me, the worship of God does not have to be your after Mass fellowship where hand shakes, smiling and other social stuff happens. Because that happens AFTER Mass, where TRUE Christian fellowship and TRUE FAITH IN ACTION counts the most! That was how the saints prayed and lived the Faith, and that is how I will do it. Thank the Lord for Summorum Pontificum! Join in. And express your opinion. What form of the Mass do you love? The Modern Rite, priest facing, vernacular, hand shakes, guitars and clapping. The Old Mass, priest back turned, chanting, Latin, embroidered vestments, silence. Tour guide and reproductive health (RH) advocate Carlos Celdran pleaded not guilty to the criminal charge filed against him for the protest he held inside the Manila Cathedral in September. On Thursday, dressed as the national hero Jose Rizal, Celdran entered his not guilty plea before Judge Alfonso Ruiz II of the Manila Metropolitan Trial Court Branch 4 during his arraignment. The complaint was filed by Monsignor Nestor Cerbo, rector of the Manila Cathedral, where Celdran staged a protest on September 30 against the Catholic bishops’ opposition to the reproductive health bill. Celdran was charged for "offending religious feelings" or for alleged violation of Article 133 of the Revised Penal Code. In an article posted the website of the Catholic Bishops Conference of the Philippines (CBCP) on October 1, Celdran held a protest inside the Manila Cathedral while an interfaith prayer service was going on. Celdran is a known advocate of the controversial RH bill and is usually seen distributing condoms to residents of Intramuros in Manila. The Manila Cathedral is also in Intramuros. On September 30, Celdran, dressed as the Filipino national hero Jose Rizal, shouted inside the cathedral that the Catholic Church should stop meddling in government affairs, especially in its birth control programs. Celdran held a sign that read "Damaso," referring to Padre Damaso, the antagonist priest in Rizal's novel Noli Me Tangere. Article 133 says "the penalty of arresto mayor in its maximum period to prision correccional in its minimum period shall be imposed upon anyone who, in a place devoted to religious worship or during the celebration of any religious ceremony, shall perform acts notoriously offensive to the feelings of the faithful." Lawyer Marlon Manuel, counsel for Celdran, meanwhile said that Monsignor Cerbo seems to be interested in pursuing the case against his client because the Manila Cathedral official sent lawyer Ronaldo Reyes as representative in the proceedings. Celdran’s supporters, who were clad in white shirts printed with the word "Damaso" — the same word the tour guide wrote on a placard he hoisted during his protest in reference to the villainous friar in the novel "Noli Me Tangere" — were also present during the court proceedings. On September 30, Celdran held his protest in front of the Cathedral's main altar, a few meters away from Papal nuncio Archbishop Edward Joseph Adams, Gaudencio Cardinal Rosales, and other prelates. Manila Mayor Alfredo Lim, government and police officials were also present during the gathering. Celdran is an RH advocate. Several versions of the RH bill have been filed in previous congresses. In the present Congress, the RH bill is known as "Bill 96" whose main proponent is Minority Leader Edcel Lagman of Albay. The RH is based on the premise that the country's population growth impedes economic development and exacerbates poverty. The bill seeks to “guarantee to universal access to medically-safe, legal, affordable and quality reproductive health care services, methods, devices, supplies and relevant information." The reproductive health bill has been a contentious social issue in the Philippines, a predominantly Catholic country. It is estimated that 80 percent of the country's population are baptized Catholics. According to the National Statistics Office, there were 88.57 million Filipinos as of August 2007. The projected population for 2010 is 94.01 million. CBCP President Nereo Odchimar earlier said the government must protect the sanctity of life by putting an end to contraceptive mentality. Odchimar said the bishops hope the Aquino administration will not pursue programs that promote the use of contraceptives such as condoms and pills. * Systematic NFP (a system that uses a woman’s signs of fertility to determine the fertile and infertile times of her cycle). Does the name Doña Consolacion ring a bell? Seems appropriate to You-Know-Who eh? Thanks Doc Ben for giving me the idea. The Knights of Columbus (KC), an international Catholic fraternal service organization, has called for a National Day of Prayer to oppose the controversial reproductive health (RH) bill in Congress. According to an article posted on the Union of Catholic Asian News (UCANews) website, the KC said the day of prayer will help people understand why the Church is against the RH bill. Chua, former president of the Philippine Medical Association, also invited lawmakers to be a part of the "national reflection" over the bill. However, he did not say when or where the day of prayer will be held. “The Church will use Facebook, Twitter and related sites to provide the right information and educate the public, especially the youth," Father Kunegundo Garganta, executive secretary of the Catholic Bishops’ Episcopal Commission on Youth said. Some of those who commented in the news article said that the CBCP has "unleashed their dogs". Your names brought back memories, for make no mistake, you are very dear to me, a “generation” of seminarians at San Carlos Seminary and the Rogationist Seminary with whom I spent the last dozen years of teaching, rudely terminated by the onset of double vision right in the classroom. Nobody noticed as I cautiously picked my way down the staircase at San Carlos. Now, you are parish priests, rectors, superiors, deans, formators, spiritual or vocation directors, etc. (It matters little whether you become bishops or cardinals). Thank you, because my heart swells when I hear of you or bump into you and can never seem to have enough of talking. How we could explore the meaning/s of each! Outspoken Coroza would readily say what he thought; De Claro would pause before giving his measured opinion; Thomas might smile and demur. Or we could confuse each other by forcing meanings that are not there. And after collegial consensus, we could finally agree that this or that is closest to the truth of the situation. Or we could hear no evil and see no evil and dismiss the matter as just an amusing story. But no one thinks it was just an amusing story. “Damaso” was instantly picked up like “wang-wang” (sirens) and meanings were attached to both its parts and to the whole. The Internet has been flooded with meanings mixed with flotsam through which you must navigate. But what is the meaning of your choice? That’s important. At this point, your one-time teacher chooses to sit with you as a forever-student. Go figure. Anyone who would comment on the RH bill should read one through. (Try the Consensus Bill for Population, Family Planning and Development. 8188501—Philippine Center for Population and Development.) [And you think we didn't? How about this: RH Bill gives 13 year old unrestricted access to artificial birth control! I highly recommend she read through Blessed Henry Newman and see how faithful the man is to the Church. Pinoy bishops to meet the Pope! “It’s called quinquennial visit ad limina apostolorum wherein the bishops will meet the pope and report on the state of their dioceses or prelatures,” Figura said. “Aside from that they are also encouraged to visit the various dicasteries or offices of the Roman Curia… the Sacred Congregations and the Pontifical Councils,” he added. According to Figura, those who would have the chance to visit the pontiff include all the 98 active CBCP members which were divided into three groups. 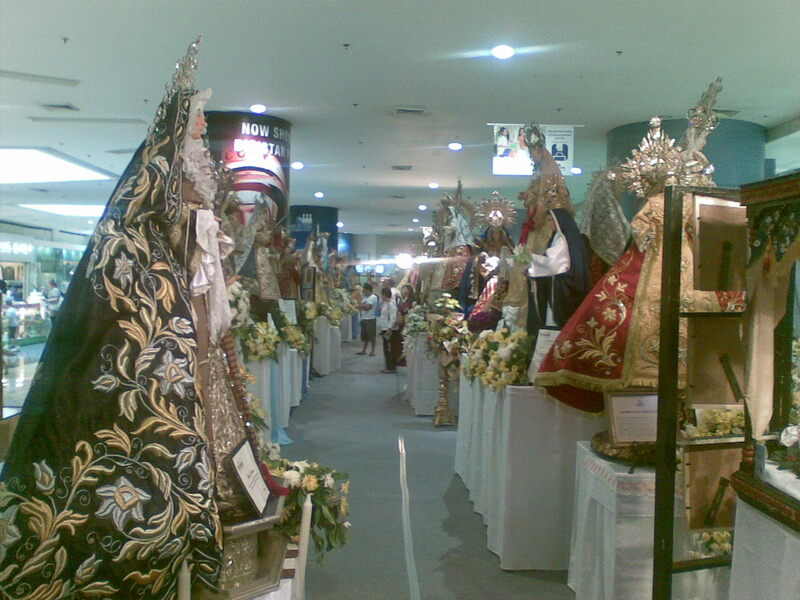 The first batch, composed of prelates coming from 30 ecclesiastical jurisdictions in Metro Manila, and Central and Northern Luzon, is scheduled on Nov. 25 to Dec.6, 2010. 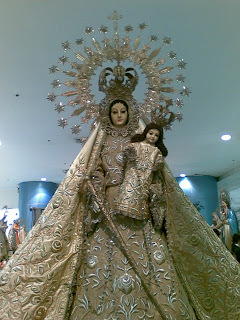 It will be followed on Feb.7 to 19, 2011 with bishops assigned in 28 dioceses in Southern Luzon, Visayas and the Military Ordinariate. I am sure the growing apathy of Pinoy Catholics will be addressed by the Pope, along with liturgical abuse, Summorum Pontificum, the defense of life, the laxity of some bishops in the governance of their dioceses...Ooops! I read my list. LOL! If you will travel to the Vatican with the Pinoy bishops, what will you tell the Holy Father? What do you think the pope will tell our Pinoy bishops? After the Holy Father declared that he will elevate Archbishop Burke to the cardinalate. Visit Congratulate Burke.com to send your greetings to one of my favorite Catholic prelates along with Archbishop Ranjith of Colombo. As usual, many thanks to the Societas Liturgiae Sacrae Sancti Gregorii for the regular updates. I am pretty sure we'll hear nagging complaints from looneys like Rina David and Conrado de Quiros about this. And the attention hungry, humpty-dumpty-look a like, You-Know-Who. With thanks to Jay Balza for the tip. SEOUL (AFP) - – South Korea on Tuesday announced plans to spend 75.8 trillion won (67.8 billion dollars) over the next five years to boost one of the world's lowest birthrates and prepare for an ageing population. The total fertility rate, the average number of children born to a woman over her lifetime, stood at just 1.15 as of 2009 compared to the average in Organisation for Economic Cooperation and Development countries of 1.71. The plan approved by the cabinet represents a 79 percent rise from the 42.2 trillion won allocated for the last five-year plan. Firms will be prodded into setting up in-house day care centres and more public buildings such as libraries will be used to care for workers' offspring. The government will try to help elderly people find jobs and state pension benefits will be raised to meet increases in the cost of living. The ministry said that if the plan succeeds, the country's birthrate should reach OECD average levels in 2020, slowing down the ageing of the population. Separate figures announced by the education ministry showed a steady decline in the number of elementary schoolchildren, to just over half the number in 1970. The OECD, in a June report, highlighted medium-term economic problems posed by the ageing population. It said more women should be encouraged to work by narrowing the wage gap with men, expanding the availability of child care and encouraging family-friendly workplaces. And they want this to happen to the Philippines? Well, everybody got the correct answer but did not find the real answer why it was wrong. The bishops at the back of the altar and the consecrating bishops in front, are all kneeling during the Litany of the Saints, which is the correct posture to assume, since the Church Militant is calling upon the Church Triumphant to pray to the Lord and ask for His blessings upon the one being consecrated bishop, who is Msgr. Ruperto Santos. But apart from turning away from the High Altar of the Mother Church of the Philippines...what is sooo painful to see is that our good bishops are asking the Lord His blessings but are turning their gaze away from Him. He is right there inside the tabernacle. 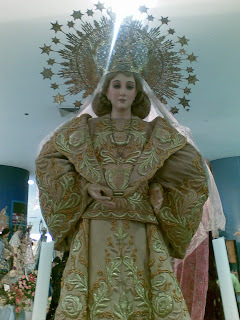 I have visited the Manila Cathedral during the episcopacy of Cardinal Sin. The Eucharist was reserved in a side chapel, the Chapel of Christ the King. But after Cardinal Rosales assumed the pastoral care of the Archdiocese, the Eucharist was brought back to the original tabernacle, in the High Altar. The tabernacle can be seen right behind the head of Cardinal Rosales. Why turn your back on the Lord? 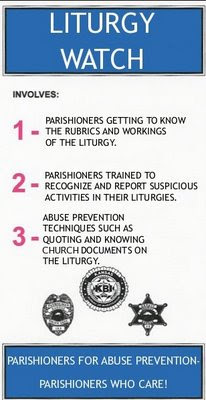 You do not have to study in a Liturgical Institute in Manila or Bukidnon to know that there is something wrong here. Here is an interesting article to read about turning toward the Lord. By the way, when you talk to your loved one, do not turn your back on him/her like the way you see it done in Filipino drama movies. Here is an interesting excerpt from Ambeth Ocampo, ex-Benedictine monk and now head of the National Historical Commission. He regularly writes a column at Hell's Bible, Pinoy version. Unsurprisingly, the author is pro-RH bill. And unsurprisingly, took pot shots at the Catholic Church. But being the historian that he is, he puts his foot down on who really is the character that Celdran and his minions use to depict ALL pinoy priests and bishops. Thanks to the FLORENTINO shout out of Doc Ben Vallejo. Gave me the "inspiration. “According to Jose Rizal’s description, Padre Damaso is a Franciscan friar that acts as the curate or the official minister of the book’s fictional town, San Diego. He was described as a fat, ugly priest with an extremely large belly. He was known to be lazy, selfish, proud, cruel, judgmental, malicious-minded and has cravings for beautiful women. “Padre Damaso was the self-righteous curate of the fictional San Diego church and town. He used his power to get what he desired. He was notorious and deceitful. His unhealthy physical appearance signified his laziness and excesses to everything that he wanted. It was he who raped Pia Alba, the wife of Don Santiago de los Santos, a local businessman. In the opening chapters of the “Noli,” Rizal described Padre Damaso as “a Franciscan, talks much and gesticulates more. In spite of the fact that his hair is beginning to turn gray, he seems to be preserving well his robust constitution, while his regular features, his rather disquieting glance, his wide jaws and herculean frame give him the appearance of a Roman noble in disguise and make us involuntarily recall one of those three monks of whom Heine tells in his ‘Gods in Exile,’ who at the September equinox in the Tyrol used to cross a lake at midnight and each time places in the hand of the poor boatman a silver piece, cold as ice, which left him full of terror. Kudos to Miguel for the photos. Proof that old things never go out of style! The main celebrant in a beautiful Roman chasuble with matching maniple! FYI, the maniple was NOT prohibited by the liturgical reform of Vatican II. So, even if the Mass is celebrated using the Ordinary Form, using the maniple is legit. Notice the beautiful Gothic chasuble of the concelebrant. Altar servers in black cassock! Notice the beautiful embroidery of Our Lady at the back! Here is a detail of the chasuble worn by the concelebrant. 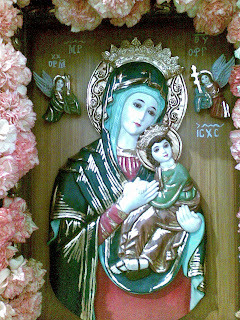 Beautiful image of Mary help of Christians. I guess the priest maybe a Salesian. Nice Y-cross design, almost looks like a Rationale. 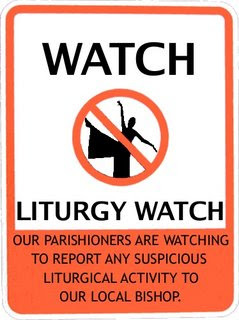 Take note that after the Liturgical Reform, the Roman Chasuble almost fell into disuse, with most priests wearing the Gothic chasuble or the plain white chasuble with an overlay stole which is forbidden by liturgical books. Then we also have the chasu-alb which would make the priest look like a flaccid white SpongeBob Squarepants! Ugh! 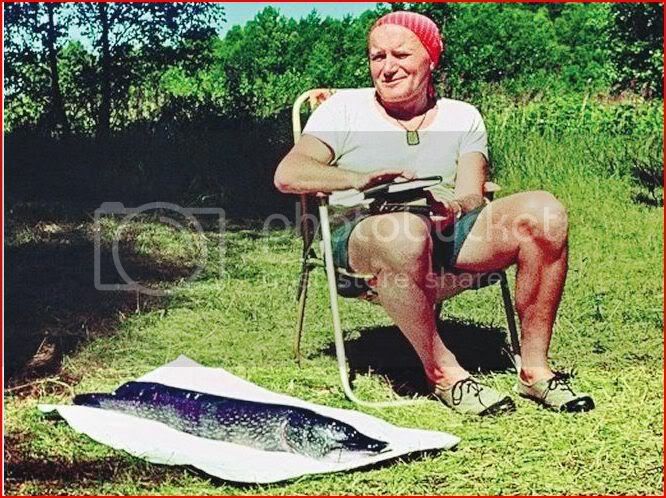 Look at the photo below of the Mass of JPII during his UK visit. The concelebrants are wearing red Roman chasubles, but minus the maniple. Notice the altar arrangement and the frontal. FYI, this is no conspiracy theory but it is a fact! 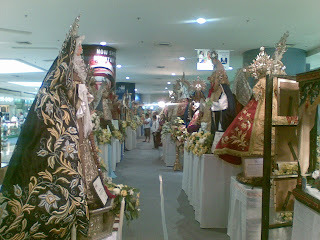 You won't see the Roman chasuble and the Benedictine altar arrangement in MOST churches in the Archdiocese of Manila! Oh come on...You know why! The use of dignified vestments for the worship of the Lord is written in Bible and explicitly commanded by the Lord. After Moses brought the Israelites to the foot of Mount Sinai, he received specific instructions from the Lord for vestments to be worn by the Priestly cast of the Tribe of Aaron (the Levites) when they were ministering in the Tabernacle as well as the specific Vestments that were unique to the High Priest alone. (Read the following: Exodus 28; Exodus 39 and Leviticus 8). So if there are those who are calling for simpler vestments, read the Biblical passages. See if they are following God's commands. I know some priests who would DEMAND that we be simple in our living just like Christ, even the vestments they use. But the Lord did not attack the vestments of the priests of the Temple. He was attacking the showy vestments of the Pharisees who, in the inside, are devoid of anything holy and laudable. An incongruence of the internal reality from the external expression! Just a hint. Try asking for the brand of their favorite shoe or shirt. You'd be surprised. Remember the priest who has a wishlist? No wonder the ranters were commenting on my challenge to Celdran. He posted it in his Facebook wall. And so out comes the name callers. You get the feeling that you are in the same environment as Fr. Miguel Pro when he shouted "Viva Cristo Rey!" They would not answer my challenge unless I reveal my true identity. And then what? You go and start calling names like how you did it in his FB wall post? Look at how Celdran and his minions talked trash to 100% Katolikong Pinoy. Warning! It's like watching a recent Hollywood gangster movie. It's laced with obscenities. Just answer the challenge. This is not a publicity stunt. I am no tourist guide. I do not appear in media. If you think that what you are fighting for is right, then you would fight for it no matter who or what organization you'll be going up against with. I will post their comments. I'll give them the freedom to express their opinions. Anyway, this is a blog space and not a church. Maybe, he really would not make "patol". Probably because it involves the INC and the Muslims. Some smart aleck guy posted a comment saying Muslims are for reproductive health bill. A Muslim group has joined the opposition to President Benigno Aquino III’s open policy towards the use of artificial contraceptives for family planning. The Imam Council of the Philippines (ICP) said it is against the use of birth control pills and condoms even among married couples. “Sa contraceptives, hindi tayo pabor diyan para bawasan ang populasyon ng Pilipinas. Kontra po diyan ang Islam dahil bakit natin i-underestimate ang plano ng Panginoon," ICPl head Ibram Moxir said in an interview on Church-run Radio Veritas. Moxir added the Islam community is one with the Catholic hierarchy in opposing the passage of the Reproductive Health bill. Excerpts of the interview were posted Friday on the Catholic Bishops’ Conference of the Philippines (CBCP) news site. Also, Moxir said he is saddened that government is pushing for legislation that will allow the purchase of artificial contraceptives. “Bakit hindi natin ilalaan ang nasabing pondo sa ibang kapaki-pakinabang na paraan? Baka maging immoral na tayo diyan. Bakit tayo mamahagi ng ganyan (Why not spend the funds for something more useful? We may lose our morality in the process. Why allocate funds for contraceptives)?" he said. Earlier, Aquino said he is open to couples using contraceptives as they should be the ones to decide what type of family planning methods they will use. Catholic Church officials have ganged up on Aquino’s stance, with CBCP president Nereo Odchimar hinting Aquino is courting excommunication with his stance. For film buffs, I know the music is familiar, so don't mind it. Look who is wearing his brown scapular! Carlos Celdran, we are still waiting!!! It has been a week since I issued a challenge to Carlos Celdran. He reacted in one of my posts but haven not in the open challenge I issued to him. I will be counting the days and will continue to do so until you are really man enough to stand up for what you are fighting for! I WILL JOIN YOU IN YOUR CRUSADE IF YOU WILL DO WHAT YOU DID AT THE MANILA CATHEDRAL BUT THIS TIME INSIDE A MOSQUE AND AN IGLESIA NI CRISTO TEMPLE. Fair deal? I think so. The INC is notorious for forcing their members who to vote for and for influencing government policies on going against just about anything that the Catholic Church supports or bans. Take their brain busting stand on the RH Bill and calling the rhythm method "unnatural". Muslim Imams of the Philippines also expressed their opposition for the RH Bill. So I think Celdran should protest their meddling too. If you think what you are fighting for is right and worth dying for, then put your money where your mouth is! We all want to see you tell the same message to the faces of the INC ministers and imams "to stay the hell out of politics!" What is so wrong in this picture? Imagine, Archbishop Burke and Archbishop Wuerl will be at the consistory that would create them as cardinals. Burke is against giving Communion to pro-abort Catholic politicians while Wuerl states this: "Our primary job is to teach and try to convince people. The tradition in our country has not been in the direction of refusing Communion, and I think it's served us well." You think he really deserves to wear the crimson vestments that symbolize his willingness to die for the Faith? The monsignor is a priest incardinated to the Archdiocese of Manila. The archdiocese's website usually posts obituaries of priests. The news of the monsignor's death isn't in the website yet. 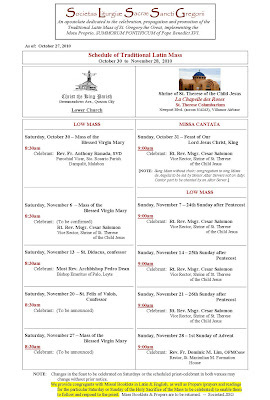 Probably liturgical news travels faster in the RCAM website, eh? Spent the whole day traveling via bus to...believe or not...the Department of Foreign Affairs to get my passport. No, the process was surprisingly very quick for a government office. What I was ranting about is the two hour travel from home to the DFA. No, thanks to the traffic of Metro Manila. After processing my passport, I went to the SM Mall of Asia to have a quick lunch. I am a lover of veggies so from among the gastronomic and cholesterol laden delights in the humongous mall's foodcourt, I chose to eat a Mongolian vegetable stir fry served on a hot plate. Nope I did not take any photos. I leave it to Fr. Z. I am not as good as a cook as he is. And besides, I ate at a foodcourt...at SM...what's gourmet in that?! 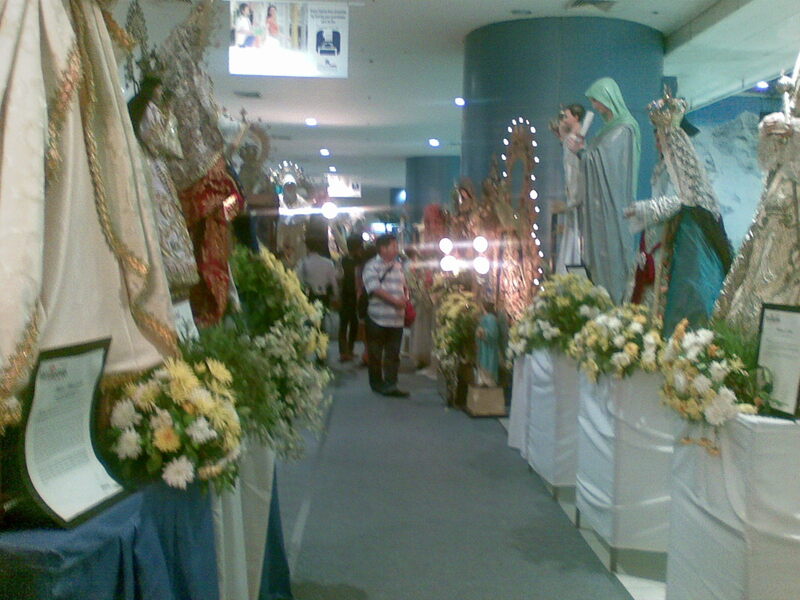 To my surprise, there was, right below the foodcourt, a beautiful exhibit of Marian Images organized by Radio Veritas. The image below is courtesy of the radio station. You can see the run dates of the exhibit. Upon entering, some of the staff will give you free Holy Cards of Our Lady of Veritas and of the Immaculate Conception, principal patron of the Philippines. There is a also an empty envelope and a blank form which you can use to write your Mass intentions. You can also use the envelope to give your donations. One of my personal favorite titles of Our Lady. 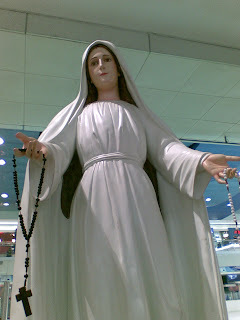 I held the hand of this image and prayed for my intentions and for those who visit, read and follow my blog. For both sinner and saint...from a sinner working diligently to become a saint. There are other beautiful statues in the exhibit that I took photos of. I will post them later as you can see in the photo below, there are A LOT! Left row from the main entrance. As you can see, there are A LOT of images in this exhibit. You cannot even see the far end of the exhibit. Oh before I end this post, here is something of particular interest that caught my eye. 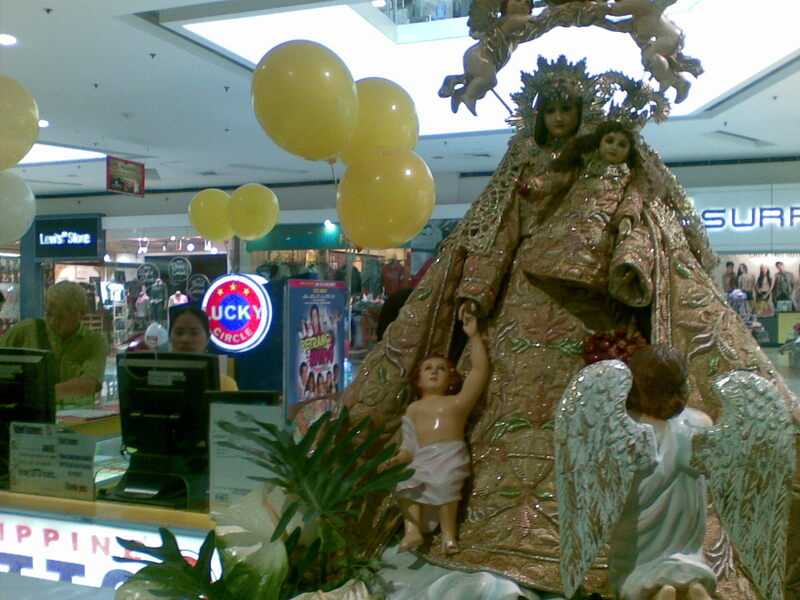 I was looking at this image of Our Lady of Salvation when I noticed people milling around. Nope. I was hoping they were praying, but they were not. They were playing the lottery! Yup, that is a Lotto station right at the side of the exhibit. 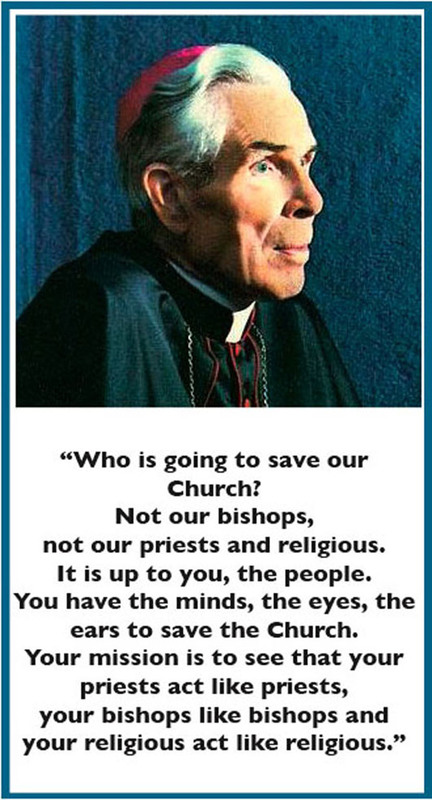 Ah...my fellow and beloved Pinoy Catholics. How cold are we! Maybe praying that they'll win? * Antonio Naguib, Patriarch of Alexandria of the Copts, (Egypt). * Paolo Romeo, Archbishop of Palermo, (Italy). * Reinhard Marx, Archbishop of Munich and Freising, (Germany). * Kazimierz Nycz, Archbishop of Warsaw, (Poland). * Donald William Wuerl, Archbishop of Washington, DC, (USA). * Laurent Monsengwo Pasinya, Archbishop of Kinshasa, (Democratic Republic of Congo). * Medardo Joseph Mazombwe, Archbishop Emeritus of Lusaka, (Zambia). * Don Albert Malcolm Ranjith Patanbendige, Archbishop of Colombo, (Sri Lanka). * Raúl Eduardo Vela Chiriboga, Archbishop of Quito, (Ecuador). * Raymundo Damasceno Assis, Archbishop of Aparecida, (Brazil). * Angelo Amato, prefect of the Congregation for the Causes of Saints (Italy). * Fortunato Baldelli, penitentiary major of the Apostolic Penitentiary (Italy). * Raymond Leo Burke, prefect of the Supreme Tribunal of the Apostolic Signatura (USA). * Velasio De Paolis, president of the Prefecture for the Economic Affairs of the Holy See (Italy). * Kurt Koch, president of the Pontifical Council for Promoting Christian Unity (Switzerland). * Gianfranco Ravasi, president of the Pontifical Council for Culture (Italy). * Paolo Sardi, vice chamberlain of Holy Roman Church (Italy). * Robert Sarah, president of the Pontifical Council "Cor Unum" (Guinea). * Mauro Piacenza, prefect of the Congregation for the Clergy (Italy). * Elio Sgreccia, former president of the Pontifical Academy for Life (Italy). * José Manuel Estepa Llaurens, military ordinary emeritus of Spain (Spain). * Walter Brandmuller, former president of the Pontifical Committee for Historical Sciences (Germany). * Domenico Bartolucci, foformer director of the Pontifical Choir Capella Sistina (Italy). Thanks to all those who emailed to me the list. Busy day yesterday, was on the road and no time to blog. Makes me wonder why he even got the red hat, why? just because he is occupying a cardinatial see? I got the link to the video of the special documentary that GMA 7 ( a local Pinoy TV station) aired about Exorcism in the Catholic Church. I cannot find the time to translate the video since most of it is in Filipino / Tagalog. Thank the Lord that my good friend, Jay Balza of Veritatem Facientes in Caritate blog, though still grieving from his dad's passing, diligently translated what was being discussed by the resource persons, primarily the exorcists of the Archdiocese of Manila and the Diocese of Cubao, none other than Fr. Michell Joe Zerrudo of Sense of the Sacred blog, in the video. 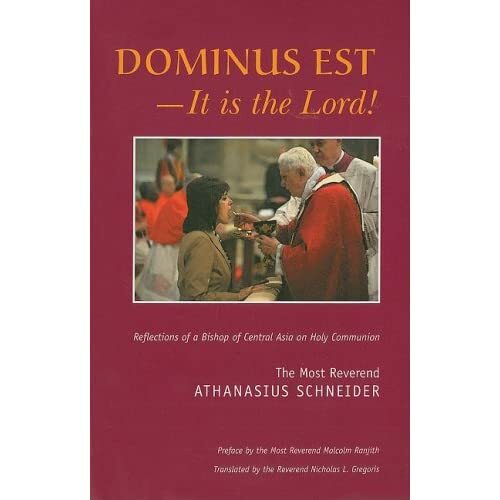 By the way, million thanks to you, Jay for giving me that beautiful book, Dominus Est of Bishop Athanasius Schneider. The reflections of the good bishop would really convince you to Stop Communion in the Hand! Sign the petition on the left side bar! Go over to Veritatem Facientes in Caritate to watch the video clips. There is an actual exorcism caught on tape when the TV crew was at the church of Fr. Jojo, the Parish of the Lord of the Divine Mercy. Tornielli responds and gives a list of the possible names of the new cardinals: "Concerning the non-Italians (in addition to the curial officials Burke and probably Koch), I would say: the archbishops of Munich in Bavaria (Germany), Reinhard Marx; of Warsaw, Kazimierz Nycz; of Washington, Donald W. Wuerl; [Which I do not want to be named cardinal due to his lukewarm response of giving communion to pro-abort politicians] of Kinshasa, Laurent Monsengwo Pasinya; of Colombo, Malcom Ranjith Patabendige Don. [HUZZAH!!!] to these I would perhaps add Collins di Toronto and an eastern Patriarch, and perhaps the archbishop of Toledo." Cruz is particularly referring to the attitude of the faithful in defending the church over calls for it to stop meddling over the birth control issue. “Truth to say, in this particular case, the silence of these well spread Catholic organizations was deafening. [I think he had someone in mind.] They were almost all so peaceful and at ease during such a shameful episode in their church,” he said. He said it is ironic that many believers don’t seem to mind these direct attacks against their church, considering that they have been fulfilling their Sunday obligations and in other church-related activities. The Knights of Columbus of the Philippines Yup! My brother Sir Knights are silent about THIS particular travesty of Celdran. In fairness, the Pinoy Knights have stood up against the RH Bill. The Church spread by the blood of the martyrs who stood up against adversity to proclaim with their very own lives the pristine truth of our Faith! Brothers, your silence is deafening! The Church is under attack and you'd rather stand aside and do your own. Don't tell us that you are even tempted to play your fiddle while the whole country goes awry? Carlos Celdran, I am still awaiting your response! Celdran, you want a fair deal? promises to take his protest outside of Church just as long as the CBCP promises to take their agenda outside of government. Fair trade. No let us take this down bit by bit. He went into a church, note small c. It is a building, not the Institution which is written with the capital letter C. Not to protest, but heckle. I know he doesn't have it between his legs to do the same: telling the Manalos and the INC inside an INC Temple to get off politics and to go inside a mosque and tell an Imam and the Muslims praying about RH Bill, women's and gay rights, which Celdran also fights for. Protest outside of the religious building? Ok. That is what CIVILIZED PEOPLE do. Expressing their opinions while respecting others. Freedom of speech and expression rests on the principle of mutual respect. So in exchange of protesting outside the Cathedral, he wants the CBCP out of government! Why? Is the CBCP IN government? Are there any bishops elected into public office? Today is the memorial of St. Luke the Evangelist. The photo you see below is the reliquary containing the relics of the saint. No other than Hell's Bible, aka the New York Times, published the report confirming the remains as those of an individual of Syrian descent who died between 130 and 400 A.D. Nay sayers? Sorry Father Anscar for ruining your "relic bashing" down and other medieval-relic- commerce-story-tellers out there but the reliquary contains the relics of the saint and not some medieval forgery. A new DNA analysis gives tentative support to the belief that the remains in an ancient lead coffin are those of St. Luke, traditionally considered the author of the third Gospel and the Acts of the Apostles. Dr. Guido Barbujani, a population geneticist at the University of Ferrara, Italy, has extracted DNA from a tooth in the coffin. He concluded that the DNA was characteristic of people living near the region of Antioch, on the eastern Mediterranean, where Luke is said to have been born. Radiocarbon dating of the tooth indicates that it belonged to someone who died between 72 A.D. and 416 A.D.
A report by Dr. Barbujani and colleagues appears today in the Proceedings of the National Academy of Sciences of the United States. The Evangelist, according to ancient sources, was a physician who was born in Antioch and died at 84 in about 150 A.D. in the Greek city of Thebes. The coffin with his remains was taken to Constantinople, the capitol of the Byzantine empire, in 338 A.D. and later moved to Padua, Italy. Dr. Barbujani and his colleagues speculate that the coffin may have been sent out of Constantinople for safekeeping, either during the reign of the Emperor Julian, who tried to restore paganism, or during the iconoclast period of the eighth century, when many religious images and objects were destroyed. 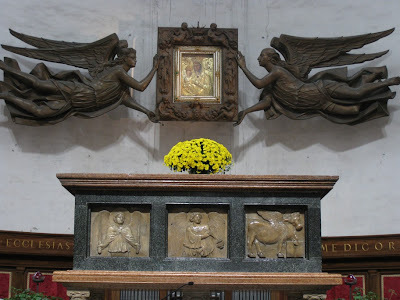 The coffin is known to have been in Padua at least since 1177 A.D. It was placed in a marble sarcophagus and kept in the Basilica of Santa Giustina. It was last opened in 1562 A.D. and seems to have been somewhat ignored until October 1992. At that time the bishop of Padua, Antonio Mattiazzo, received a letter from Hieronymos, the Orthodox Metropolitan of Thebes, asking that part of the relics to be donated to the site of Luke's tomb in Thebes. Bishop Mattiazzo, according to an article in November 2000 in Traces, a Catholic journal, decided to investigate the relics under the leadership of Dr. Vito Terribile Viel Marin, a pathologist at the University of Padua. In 1998 the 400-year-old seals were removed from the lead coffin, and the study began. The dimensions of the coffin exactly fit the tomb in Thebes considered to be Luke's. In the coffin was a skeleton, but not the skull. Dr. Barbujani and his colleagues say the body appears to have decomposed in the coffin because of matching insect marks on the lead and the pelvis, which has fused to the lead. The spread in the radiocarbon dating indicates at least two possibilities. One is that the body is that of Luke or a man who died at the same time, the other is that for some reason, a new body was put in the coffin in Constantinople around 300 A.D.
To help distinguish between the two, Dr. Barbujani, an expert on the genetics of European populations, analyzed fragments of DNA from the tooth, a canine, found on the floor of the coffin, and sought to compare them with likely living representatives of the ancient populations of Antioch and of Constantinople. An Antioch match would suggest the body could be Luke's. Since the present population of Antioch includes many Kurds, Dr. Barbujani sampled the DNA of Syrians from nearby Aleppo. In place of the inhabitants of ancient Constantinople, now Istanbul, he tested Greeks from Attica and Crete. The DNA from the Padua tooth, a type inherited only through the mother's line, turned out to resemble Syrian DNA more than Greek DNA. ''Our data tell us the body is absolutely compatible with a Syrian origin,'' he said. ''But I am aware of the limitations of the DNA data, and though a broad spectrum of ages is possible, the most likely is 300 A.D.'' Hence both possibilities should remain open, he said. The body, if indeed it is Luke's, has experienced a simpler voyage through history than the head, which was removed by the Emperor Charles IV in 1354 and taken from Padua to Prague, where it rests in the Cathedral of St. Vitus, in the Prague Castle. ''There were officially two heads of St. Luke, one at Prague and one in Rome,'' Dr. Barbujani said. At Bishop Mattiazzo's request, the Prague skull was brought to Padua and found to fit perfectly to the topmost neck bone. The tooth, found on the floor of the coffin, also fit into the right socket in the jawbone. Though many relics turn out to be forgeries, executed in modern or medieval times as demand arose, the Padua body seems more likely than most to be what it is claimed to be, although exact proof is lacking. ''I think we should accept that there is no way to tell if it was the Evangelist Luke, but the genetic evidence does not contradict the idea,'' Dr. Barbujani said. Last October, according to the Traces article, at least part of the body completed the circle to its original resting place. Bishop Mattiazzo sent a rib from the skeleton for Metropolitan Hieronymus to place in the empty Theban tomb. Fr. Jojo Zerrudo, our very own Fr. Z, has posted a very nice quotation about the Veneration of Relics of Saints, in response to the Rorate post about Master Inculturator, Fr. 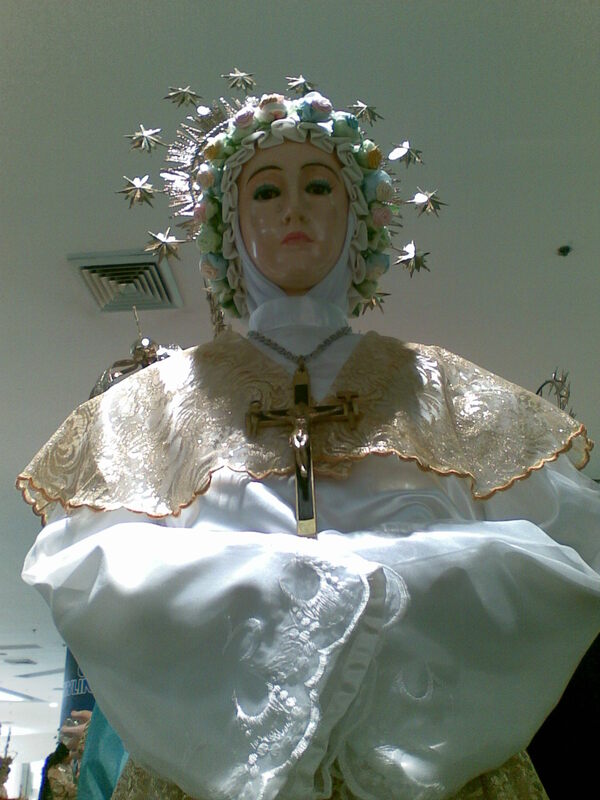 Anscar Chupungco's seeming mockery of the veneration of saints' relics. Go visit his wonderful blog aptly title Sense of the Sacred for the quotation from the Council of Trent, which Fr. Jojo masterfully used as a response to the mockery. Speaking of the Council of Trent, I think most Bugnini liturgists hate to even mention the name Trent. Sends shivers down their spines. Like holy water on the skin of the possessed. To those out to fight the Church... give it your best shot! Needless to say, everything is hereunder said and noted, is not for agnostics who acknowledge no God, neither for eclectics who simply choose what they want to believe as their own private and personal choice - nor is this short and elementary composition intended for people who subscribe to any sect here and there that come and go, or any system of beliefs that blatantly defies all logic and reason. In other words, this whole plain and simple matter about certain particulars about the Catholic Church are the concerns the faithfully practicing Catholics, of the occasional Catholics and even of but the nominal Catholics. The fact is that the central site of the Catholic Church is officially known, called and acknowledge by the civilized word as the "Vatican City State" that has formal diplomatic relations with most Countries, that sends to and receives Ambassadors from said Countries. It is also a standing fact that in Countries that have Apostolic Nuncios, these are automatically recognized as the Head of the Diplomatic Corps of the Nations concerned. One: In the past, there were Priests, Bishops and even Popes who tried to destroy and erase the Catholic Church from the face of the earth - not to mention secular potentates of all kinds that attempted to do the same. [Let us not forget that one of the first apostles which Christ Himself chose, betrayed Him to His death! Even the first pope went chicken when subjected under pressure.] Yet, the Church is still here. Two: In this period of Phil. History, there are a number of politicians and citizens who harbor hatred for the Church [Ah...Masons? Rabid Harlots?] -- and if possible, want her out of their way. But as sure as the sun will shine tomorrow, the Church will be then up and about. Three, finally, it is good to remember an ominous reality, viz., those Catholics of whatever political affiliation and ideological persuasion, will be usually brought to the cemetery by the Church. Lesson: Fighting is the Catholic Church is inutile! In other words...BRING IT ON! To all Catholics, be proud of your faith! Wear your cross or scapular! Neither does it need any academic degree to understand the following elementary conclusions: One, woe to the irresponsible if either or both parties get married. [That is why some priests even discourage couples of getting married just for the sole reason of getting the woman impregnated.] Two, woe as well to the irresponsible for daring to be a spouse or spouses. Three, woe eventually to the irresponsible for expertise in procreating but incapable of educating the children born thereof. Even animals demonstrate their attention and care for all their little ones they brought into the world. Conclusions: Irresponsible are the spouses who eagerly exercise their right to copulate but at the same time rejects the possible procreation that goes therewith. Also, irresponsible are the people who give, offer or provide the anti-natalist means to couples in order for these to desire and enjoy copulation but nonchalantly deny and discard the children who can consequently born therefrom. This is a living,, example of couples who crave for the "sarap" by junks the possible "hirap" that may arise therefrom. Excellent post, don't you think? Use this argument to trump those who think that all we cry out loud about the RH Bill is letting women give birth "indiscriminately". Six new saints to be canonized! MANILA(CBCPNews.com), Oct. 15, 2010—A known human rights advocate is the new archbishop of the Catholic Archdiocese of Cebu in a papal appointment announced Friday. Palo Archbishop Jose Palma will replace Ricardo Cardinal Vidal whose resignation was finally accepted by Pope Benedict XVI. Vidal has submitted to the Holy Father his letter of resignation in 2006 when he turned 75 years old. The last two archbishops of Cebu have received the red hat. Cardinals Julio Rosales and Ricardo Vidal. Will Archbishop Palma be elevated to the cardinalate? We will have to see that. He is only 60 years old. Pretty young for an archbishop and a soon-to-be cardinal. He received his licentiate in Sacred Theology at the University Santo Tomas Manila, and a doctorate from the Pontifical University of St. Thomas Aquinas in Rome. He was appointed Archbishop of Palo, Leyte, replacing the Archbishop Pedro Dean who regularly celebrates the EF Mass at the Lower Chapel of Christ the King Parish Church at Greenmeadows, Quezon City. Abp. Palma is also the Vice President of the CBCP. I heard that he is friendly to the Traditional Latin Mass community and has even said an EF Mass! with that kind of a lead paragraph, you might wonder what kind of qualifications CBCP writers have for a new archbishop. Cardinal Vidal turned 79 in February but the Holy Father deferred his retirement until the mandatory retirement age of 80. Actually I am more inclined to see the replacement of Cardinal Rosales of Manila, who turned 78 last August. He submitted his resignation letter when he turned 75, the required age for bishops to retire. However, we still see no signs of a replacement soon. Guess Chupungco and the gang can have more time, eh?